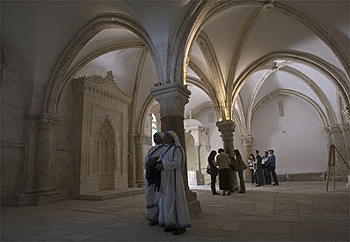 Nuns visit the Cenacle in Jerusalem's Old City, the site where the Last Supper was to have taken place. The breeze cooling the furnace-like lakeshore funnels down between hills behind, redolent of history like so much else in the Holy Land. One, an extinct volcano popularized as the "Horns of Hattin," marks the site where Saladin defeated a Crusader army in 1187. Closer again is the cliff-face where over a thousand years before, Jews are said to have committed mass suicide rather than be taken captive by the Romans in 67 AD, 3 years before the destruction of Jerusalem and a better-known mass suicide at the Masada. Downhill is the reed-laden lakeshore along the Sea of Galilee, where Jesus Christ walked. He may well even have preached in a startling new discovery 200 meters from the water's edge at Magdala, thought to be the home-place of Mary Magdalene, 5 kilometers from Tiberias and around the same from Capernaum. A synagogue dating to the first century AD, possibly destroyed during the same Jewish revolt, has been discovered during excavations for the construction of a new Catholic pilgrimage center. Like many other locations in the country, Magdala is precious to more than one religion. An image of a seven-branched menorah (a type of candelabra) found at the synagogue dig is apparently a replica of the iconic menorah held at the Second Temple, nowadays reproduced on Israel's coat of arms. The temple was destroyed by the Romans in 70 AD, marking the start of 2000 years of Jewish dispersal prior to the formation of Israel in 1948. Back in Jerusalem some of the most important and poignant landmarks for the three monotheistic faiths are located within a stone's throw of each other. One diplomatic flashpoint is the Cenacle, where the Last Supper is said to have taken place as well as the descent of the Holy Spirit on Pentecost. Underneath is the supposed tomb of King David, founder of Jerusalem and the Jewish kingdom, and from whom Christ is said to be descended. The interconnectedness—and rivalries—between Judaism and Christianity could hardly be better encapsulated in one set of buildings. Moreover, windows inside contains Arabic lettering, relics of the mosque installed in place of the church after the conquering Ottoman Turks evicted the Franciscan custodians of the site during the 16th century. Sovereignty over holy sites is a core issue in ongoing Israeli-Holy See negotiations. The latter supported the 1947 U.N. Security Council Resolution 181, which partitioned Palestine. The two sides did not establish diplomatic relations until 1993. Still, they were in close touch long before, much as the United States and Holy See had informal discussion decades before Washington granted formal recognition in 1982. Meeting on June 15, Israel and the Holy See agreed to disagree on who controls the Last Supper Room, removing it—for now—from the basket of bilateral issues being discussed by the two sides over the past decade. Uri Goldflam is an academic and tour guide based in Jerusalem. Speaking inside the Last Supper room, he said that Israel is loathe to grant the Vatican control there as it would lead to it being converted to a church, denying access to people from other religions. Catholic scholar George Wiegel countered by saying that practice and precedent at other Catholic pilgrimage sites in the country belies this assumption. The legal status of church properties and communities in Israel are perhaps the trickiest area of contention. When the region was controlled by the Ottoman Empire and later the League of Nations, those properties enjoyed a special legal and tax status, which has apparently been rendered unclear by the creation of the State of Israel. Theologically, much has been done in the past half-century to pave the way for a diplomatic relationship. The Second Vatican Council adopted the "Declaration on the Relation of the Church to Non-Christian Religions," called Nostra Aetate (in our time). The declaration addresses the church's relationship with all non-Catholics and, in particular, affirms the deep connection between Christianity and Judaism, rejecting anti-Semitism "any time and by anyone." Pope John Paul II made an emotional visit to the Western Wall in 2000, which author Dore Gold says, in "The Fight for Jerusalem," marked a dramatic shift in the "theological connection between Christianity and Judaism" with the Church unlikely to backslide to what he described as "its formerly ambivalent attitude." Thus, bilateral negotiations continue amid occasional lurid headlines suggesting that Catholic-Jewish relations are bogged down in the "black legends" of the past. After a deluge of stories about Holocaust-denying former bishops, Pope Benedict XVI made a successful visit to the Holy Land last year, though he refused to tour the inside of Jerusalem's Holocaust museum, Yad Vashem, unless an exhibit depicting World War II Pope, Pius XII, as indifferent to the Shoah, was removed. Views are divided on the historiography—though these do not manifest themselves as virulently as the headlines imply. Raymond Cohen, who teaches international relations at the Hebrew University of Jerusalem, said, "In Israel people believe that it might have helped had the supreme moral leader of the world spoken out against the Nazi exterminations of the Jews." Defenders of the wartime Pope say that a more outspoken approach would have only increased persecution of Catholics and clergy in Nazi-occupied Europe. Wiegel, a Papal biographer and more recently author of "God's Choice: Pope Benedict XVI and the Future of the Catholic Church," said that arguments over whether Pope Pius XII should have said more will continue, but he adds that "no serious student of these matters believes that he was indifferent to the fate of European Jewry, and most now recognize that he ordered Catholic personnel and institutions in Rome to do whatever they could to save Jews—which included hiding Jewish refugees at the papal summer villa at Castel Gandolfo." In any case, these issues do not appear to affect bilateral relations. Professor Cohen, who is currently conducting research on Israeli-Vatican relations, added that "the negotiations are protracted because they are immensely complicated" and that both sides "have a good personal and professional relationship." Neither side gives away much, often issuing laconic joint statements. The last, dated June 16, included the following: "The plenary welcomed the progress accomplished by the 'working-level' commission since the previous plenary, and has agreed on the next steps towards conclusion of the agreement." Both sides will meet again in December. Though Jerusalem is famously divided and site of multiple interfaith turf wars dating back 2000 years, the contemplative silence of the Galilean lakeside might provide a setting for a more ecumenical, collaborative approach. Fr. Eamon Kelly is based at the Notre Dame Institute in Jerusalem, which is overseeing the construction of the Magdala center. He said that the site "will be important for religious dialogue—between various Christian denominations and between Christians and Jews, and a location where all can be together." This article was originally published by the Asia Times: www.atimes.com.